"Two's company, three's a crime." Bandits (2001) is packed with crime, comedy, and romance as it follows two convicts, Joe and Terry, through their adventurous breakout from a prison in Oregon. 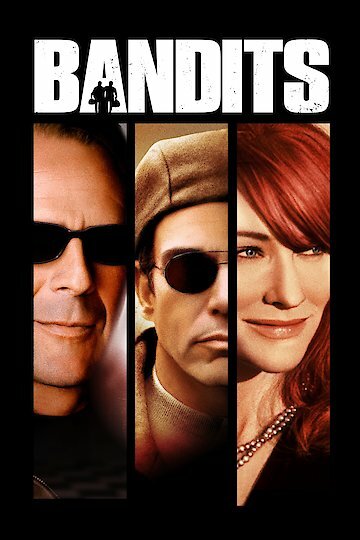 Known as the "Sleepover Bandits" because of their bank robbing techniques, they take on stunt-man Harvey as a getaway driver and lonely housewife Kate as a love interest...for both of them. The movie is told in a series of flashbacks as the viewers begin to wonder if the team will be able to pull off its last heist after a series of arguments that force them through several ups and downs. Bandits is currently available to watch and stream, download, buy on demand at Amazon Prime, Starz, Amazon, Vudu, Google Play, iTunes, YouTube VOD online. Both she and her sister have come clean about being clean recently.